When living in Chicago or even visiting Chicago, there is always something to do. 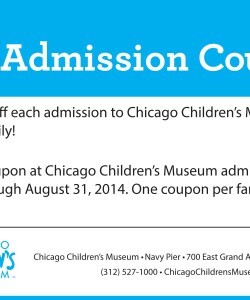 You can have a blast and take the kids to have great fun with this CHICAGO CHILDREN’S MUSEUM DISCOUNT COUPON. 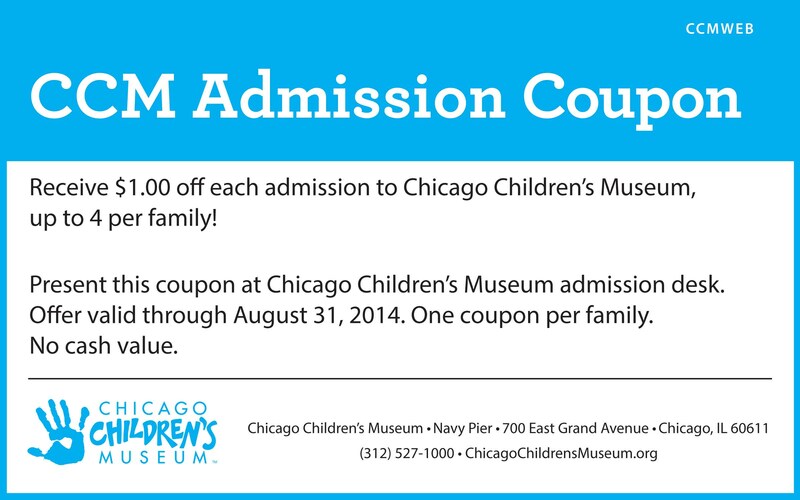 You can save $1.00 off each admission to the museum, and it’s good for u to 4 per family! That’s an excellent discount. Children’s Museums are great placed to take the kids. Beyond exhibits, they usually have fun and interesting activities for the children. Chicago Children’s Museum has an awesome tag line – where play and learning connect. How cool is that? They have playgroups and a variety of other things for children to do. Painting, learning about history and other activities take precedence for the kids. It’s an amazing time for children and there’s things for parents to do too! Your kids can have hours of enjoyment at the Children’s Museum, which will in turn give you hours of satisfaction at having somewhere to tire the kids out and learn in the process. It’s a fun and educational way to keep them occupied. 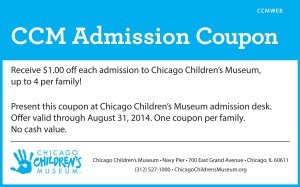 If you are an out-of-town visitor, you can put this one down for your child to visit, making memories. And one of the good things about the Children’s Museum is the location. It’s right on the Navy Pier. That’s a major attraction, so when you’re done at the museum, you can plan your day around all the sightseeing opportunities that are there. Grab the kids and make an entire day of it. Everyone will be happy they got to do and see something that made them happy and you can have a relaxing evening afterwards. When the kids do arts and crafts at the museum, there is usually something for them to take home to display.